"Roll over" is a cute and fun trick to teach your dog. Before you start, your dog should already be able to sit and lie down on command. It is a bit more difficult to teach your dog to roll over than it is to teach him some other commands because this trick has a couple of parts to it. But with a little patience, your dog will be rolling over before you know it. Before starting, make sure you have some treats and your clicker, if you are clicker training your dog. Practice the trick in a soft, comfortable area that will keep your dog relaxed, and where you can return to continue training. Start training your dog to roll over by giving it the "down" command. Once it is lying down, the next step is to get it to begin to roll. Hold a treat by its nose, and then pull the treat from the tip of its nose toward its shoulder. Your dog should turn its head to follow the treat. If it does, you can continue to pull the treat around the dog's shoulder so it will have to lie down on its side to follow it. Continue holding the treat close to your dog's nose, and pull it all the way around so it has to roll all the way over to follow it. If it completes the full roll, praise the dog or click your clicker and provide a treat. While it would be great if your dog rolled over all at once, most dogs don't turn all the way around to follow the treat on the first try. Your dog may jump up, wiggle, or move its head around to the other side to try to get the treat. If this is the case with your dog, you can break the training into smaller parts. With your dog lying down, hold a treat at its nose and move it toward the dog's shoulder. The moment the dog turns its head, click or praise it and give it a treat. Practice this several times until the dog is consistently turning its head. Next, stop giving your dog a treat for every head turn. Give treats only for the head turns that bring it closest to lying on his side. Finally, only give your dog praise and a treat when it's lying on its side completely. This is how you can slowly select the behaviors that come closest to rolling over, with each new behavior bringing the dog closer to completely rolling over. Once you're able to get your dog onto its back, it's fairly simple to lure it over to its other side and into a sitting or standing position by holding the treat in front of its nose. Regardless of whether you teach this trick in pieces or not, it's often easiest to add the command once your dog is consistently rolling all the way over. Once it's smoothly following the treat and rolling over each time, it's time to add the command. Hold the treat in front of him, give the command "roll over," and lure him over with the treat. Practice this over several training sessions. The final step in teaching your dog to roll over is to stop using treats to lure him into the roll. Once your dog has rolled over after hearing the command a number of times, start off by giving the command and waiting a few seconds. Some dogs catch on quickly and will roll over immediately. Once the dog has rolled over completely, click or praise and give a treat. If your dog doesn't immediately respond to the command, you can phase out the treat more slowly. Start by giving your dog the command "roll over," and use the treat to lure it part of the way over. Move the treat away once the dog is in motion. Slowly decrease how far you lure it with each training session. Most dogs catch on quickly, and will soon be dropping into a roll on your command. If your dog is making a lot of mistakes, such as jumping up or turning its head in the opposite direction, you may be moving ahead too quickly. Go back a step or two to when your dog was performing well, and start to slowly build back up to a full roll over. 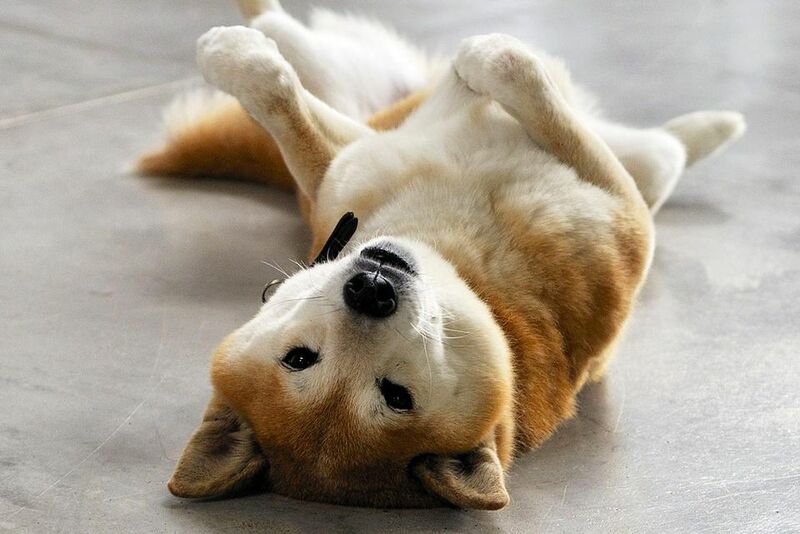 Some dogs can be resistant to lying on their backs and showing their bellies. In this case, make sure your dog knows that training is just fun and games. If it enjoys belly rubs, scratch its belly, and click or praise and give a treat every time it offers you its belly. Be sure to keep your voice light and positive. Take a deep breath and relax. This can take time, but there's nothing to be stressed about. It's also important to keep training sessions short and upbeat. Training sessions that are too long tend to become frustrating for both you and your dog. Keep training to about 10 minutes each time, and try to end each session on a positive note.